$55, included breakfast, lunch, and resource notebook. Individuals in the Appalachian Grown region receive a discounted rate of $45. The conference is currently sold out. Farm to school programming connects classrooms, the cafeteria, and the community—helping children develop healthy relationships with food and enriching the overall educational experience for children and adults alike. The movement is growing, nationally and here in Western North Carolina. 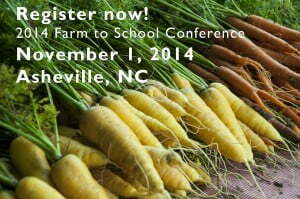 This year’s Farm to School Conference will offer multiple workshop sessions geared specifically for teachers, early childhood educators, parents, community health professionals, and child nutrition staff. Participants are encouraged to invite key stakeholders in their school or community to join them at this training, creating “teams” that can support and sustain farm to school efforts. Join educators from across the southeast to strengthen existing programs and jump start new farm to school efforts in your community! This year’s conference will feature workshops focused on four specialized tracks. Each track features content for folks new to farm to school as well as those that want to improve their existing programs. $45-$55 includes resource notebook, local food breakfast, and lunch. Coming from out of town? Click here to see lodging options in the Asheville Area. All k-12 attendees will receive certificates of completion for CEU purposes upon request.